What do you get for the person (or couple) who has everything? That's what B and I were stuck on when it came to his parents. 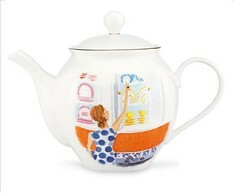 In the end, I found the perfect gift after scouring the web. The Smartbox gift card that we purchased for them is perfect. They love having nights away, and now they can use our gift to book one night away at one of the Bed and Breakfasts in the guidebook, located in the Northeast United States! 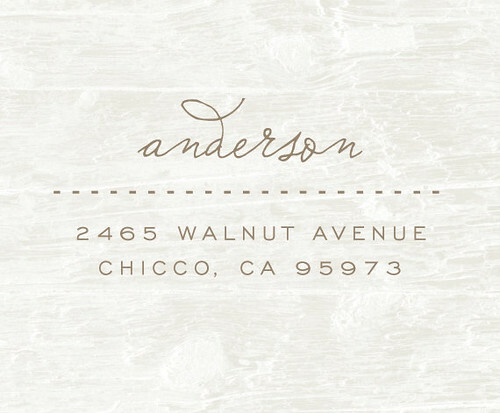 For my sister-in-law, I ordered her a custom return address stamp from simpleANDpretty on etsy. I picked the style below and then we bought her an ink pad and some pretty stationary to put together a little stationary set for her. It was so fun to do! 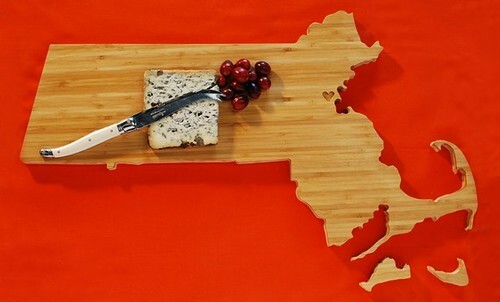 And since he pretty much rules our kitchen (and melted our second cutting board), I ordered him this custom Massachusetts cutting board from AHeirloom, over on Etsy. 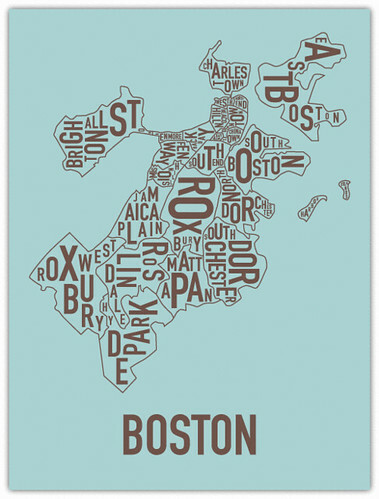 A little heart resides right around the area of Boston! My One Line A Day Journal from my cousin. We both started them on Christmas Day together! 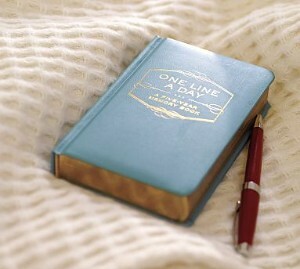 B got me the this journal. 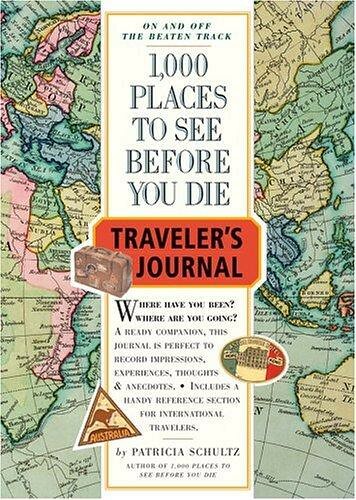 I already have the book, and the journal come with the checklist of all of the places. Though we have both traveled separately, and seen many of the places - I'd like this checklist to be of all of the places we have seen together. So far we've done 5 of the 1000... we better get on it! I also got the Kate Spade teapot and cake plate I have been admiring since way back in June - thanks to my parents and my brother and sister-in-law! They were all so good to me! B's Mom and Dad brought me some gorgeous vintage hankies, from B's grandmother! They are beautiful, and now I just need to decide how to display them. What were some of your favourite gifts to give and receive? B's off the remainder of this week and into the new year, and we plan on squeezing in some family time and crossing a few projects off of our to do list. I'll be back in the New Year, hopefully with a ton of bathroom updates and some other fun projects to share! As you can tell, she's up to a lot of new things already! 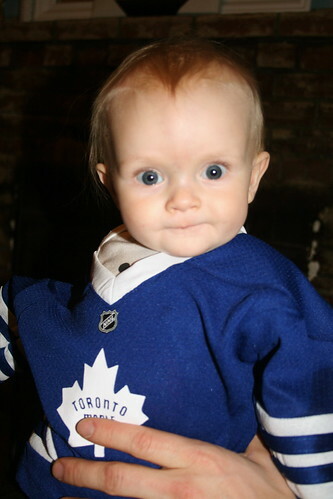 - Our little girl is fantastic at sitting on her own. We're still working on the balance, but she was sitting real well all by herself for this photo shoot (Grandma was off to the side to catch her if she started to go and was unable to balance herself). - We're getting a lot more sleep around these parts. Some nights 5 hours stretches... but a lot of 6, 7 and even 8 hour nights as well. Thank you little munchkin. Mommy and Daddy are loving it. - She's grabbing everything... and I mean all of it! Toys, Mommy's hair, Mommy's face, Mommy's clothes.... the dog's ears. - She loves her dogs. She can be in the middle of a crying fit and if that Harley walks into the room, it's big smiles instantly. They are the light of her life... not Mommy and Daddy. - She's working hard at trying to crawl during tummy time. I imagine it wont' be too long before we have a mobile little girl - exciting, scary and sad all at the same time. Thankfully B purchased a fantastic video camera as a Christmas gift and we're already recording as much as we can. I savour these moments of her transitioning from a baby to an infant... she's growing far too quickly. 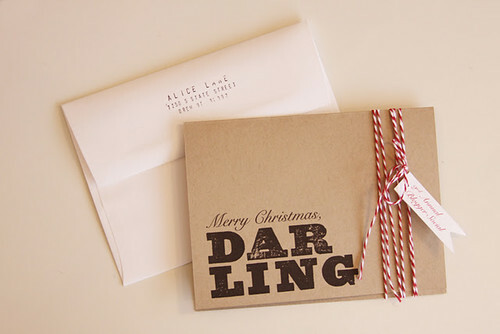 Last Friday Kirsten shared some photos from the Alice Lane Blogger Holiday Social - looks like it was a ton of fun. I love the idea of a homemade gift giveaway, and I think it would be a fun thing to do with friends at this time of year! I am always inspired by people who see things they love... and then turn around and use their creativity to make it their own. 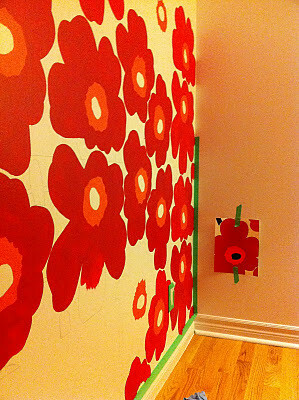 I mean, check out the Marimekko Wallpaper that NK is recreating herself in her daughters room - crazy good, right? 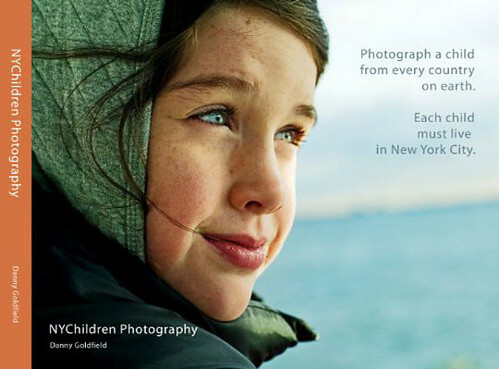 What a great post on Oh Happy Day on Monday! 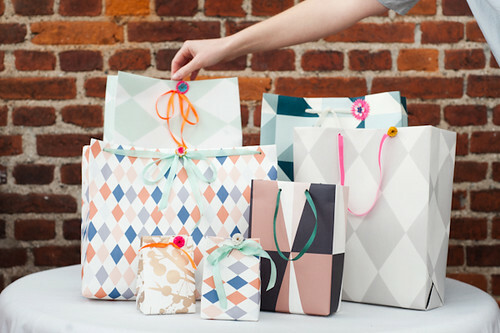 Is anyone else prepared to try making their own wallpaper gift bags? I think this is absolutely brilliant! Well - this is it kids, tomorrow is Christmas Eve! 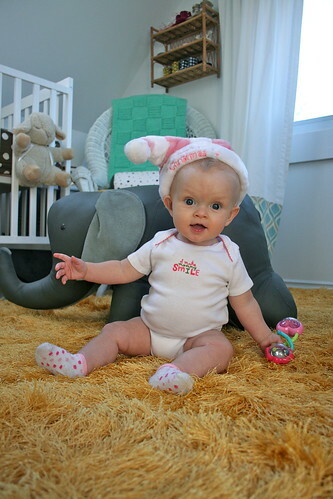 Halle's very first Christmas and we couldn't be anymore excited! I can't wait to share details with you, and hear about how all of you celebrated! Surround yourself with those you love. Smile, laugh, love, celebrate... and eat lots of yummy food! I'm signing out for a few days to enjoy and I hope that all of you do the same! ... and we're just about done. I just need to pick up two things and finish my wrapping! 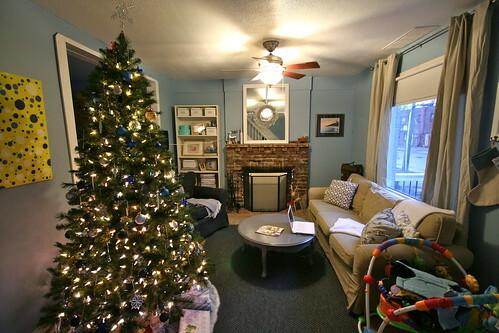 B's parents will be here on Wednesday and we're all just so excited for this Christmas. It was one of those weekends that truly got me into the spirit! 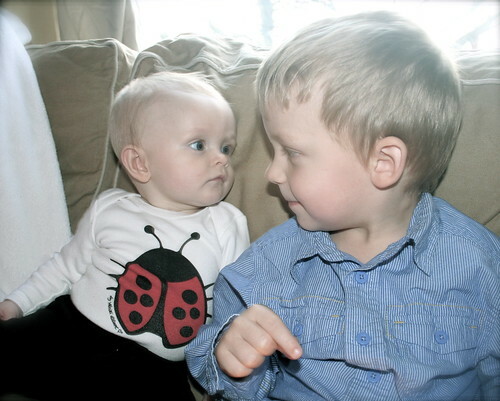 Seeing our two little ones, who are 2.5 years apart, looking at each other like that, is so incredible. Wasn't it just yesterday that we ourselves were just kids, having a sleepover every December 23rd wrapping gifts and watching Garfield's Christmas special? Time sure flies! 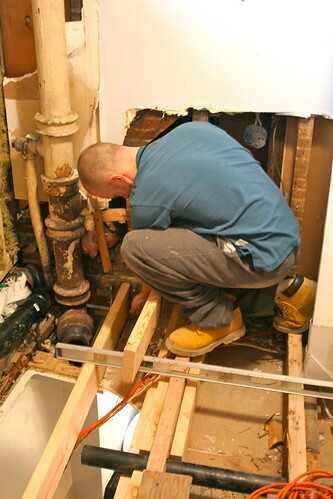 Our floor joists are repaired and safe, and the rest of the floor is now level. They also got to cut the new subfloor, though it's not ready to be secured down yet. Soon though! 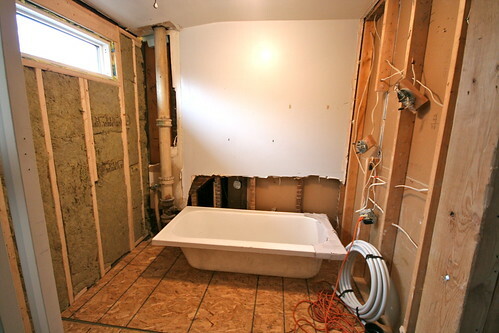 The worst is behind us (famous last words), and this thing should slowly but surely start to resemble a bathroom again, very soon! I'm beyond excited at the moment, let me tell you! I hope to be sharing some more updates once the Christmas rush is done and over! Come on bathroom! 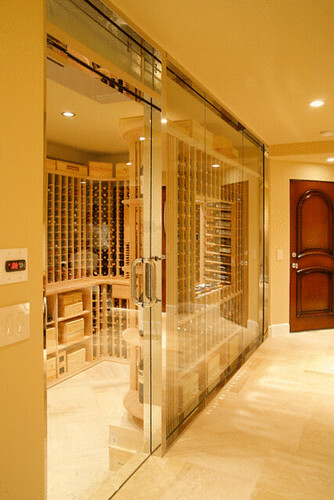 I'm dying to enjoy a nice hot bath with a glass of wine! What did you get up to this past weekend? A short and sweet post from Brittany last Friday evening was full of twinkling light goodness... exactly what I love about this time of year! 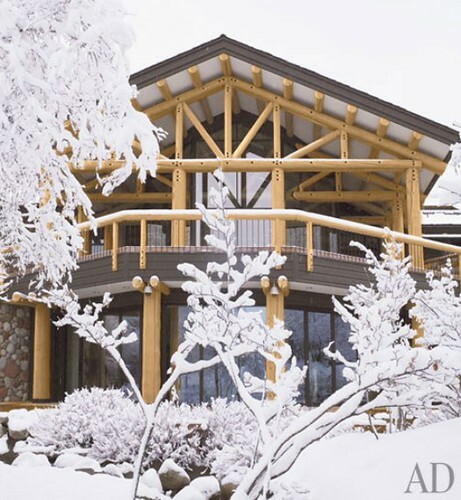 I'd love to get away to this Aspen ski lodge, that was shared on Verdigris Vie earlier this week. 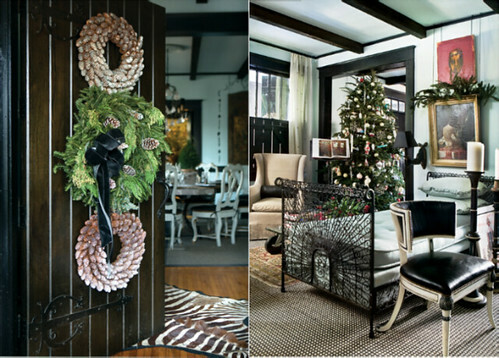 A great Holiday How-To from Brooklyn Limestone this week, for some cute unconventional wreaths. 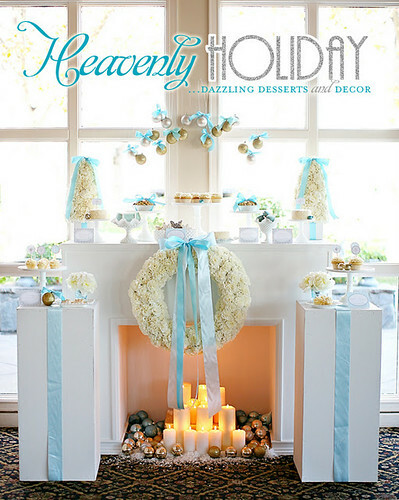 I'm a huge fan of that adorable wooden spoon wreath! 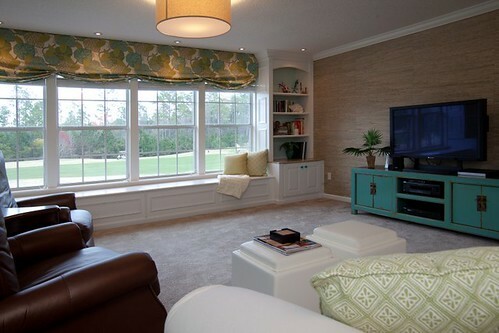 You must check out this before and after of a bonus room over on the cottage mix! 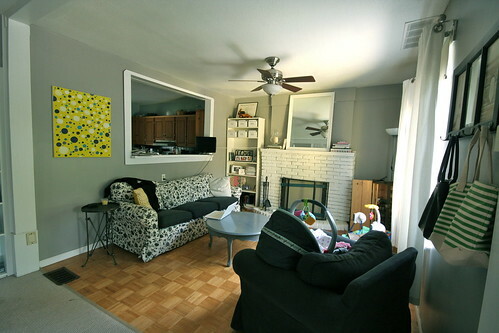 Lauren did a fabulous job turning a boring old, empty space into something fabulous! 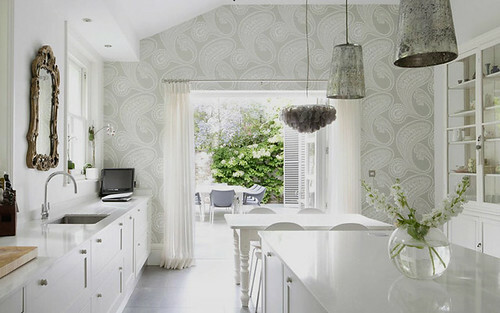 While catching up on blogs, I fell in love with this home, featured on desire to inspire back at the end of November. It's absolute perfection! We have so many fun things planned for this weekend! This afternoon Halle and I are headed into my office for a holiday lunch! I cannot wait to see everyone - it's been almost 4 months since we last visited! Tomorrow we are having some guests over for a Christmas dinner, and Sunday will be a bathroom work day for B and my Dad. Hoping for a little more progress! 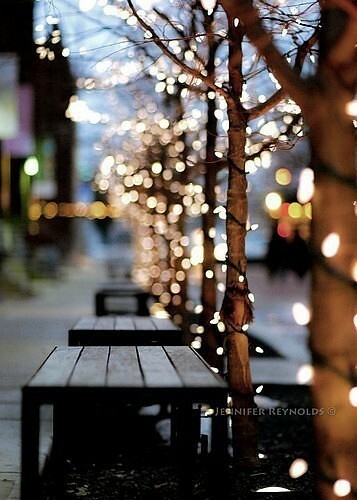 What fun and festive things do you have planned for this final weekend before Christmas? The Living Room - Making Progress! It's been a while since I've given you a look at what's been happening with our living room refresh. 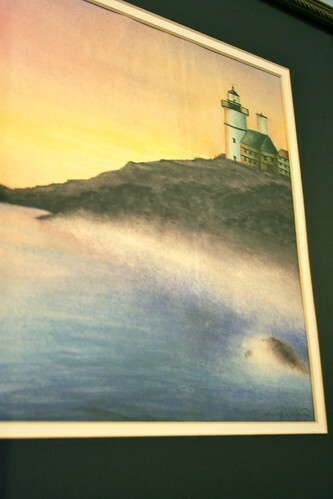 Actually, I'm pretty sure that my last post was on how we ripped the brick off our fireplace to uncover the original. Well, not much has changed with the fireplace, but we have been doing our best to spruce up the room in preparation for Christmas guests. 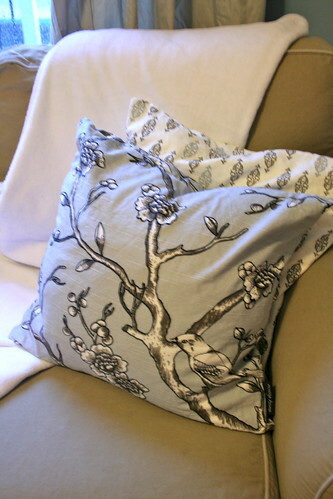 One of my favourite changes has been the addition of these beautiful throw pillow covers from Nudge Home. 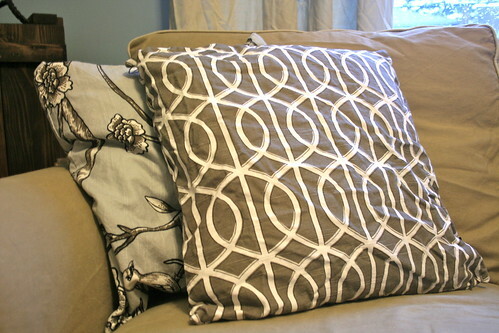 I won them in a giveaway hosted by Vanessa over at decor happy and they are just fabulous! 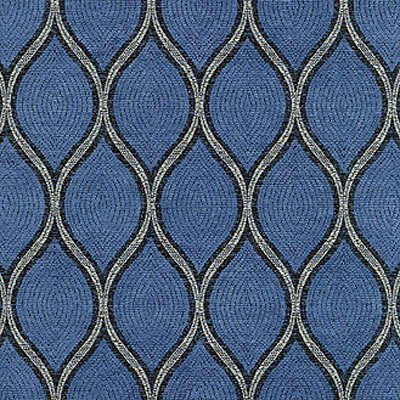 The colours in the Dwell Studio fabrics are perfect in our room, and the quality of the cover's is fantastic! 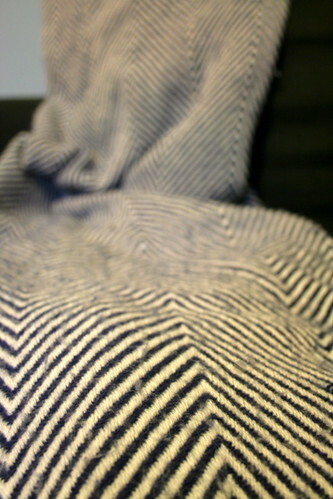 Oh... and B's Mom also gave us that snuggly white throw while we were visiting for Thanksgiving! We love it! 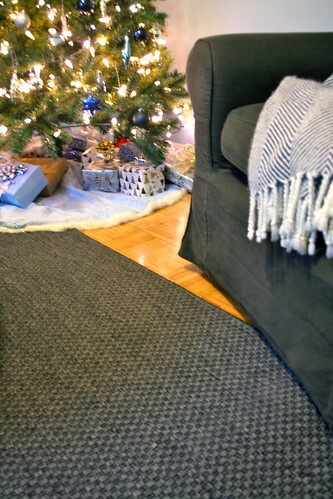 This past week we came across a great area rug while at IKEA (It's the MORUM in dark gray). We lucked out when we found it in the As-Is section for $60, after admiring it in the marketplace (the same kind of luck we had with our Manstad Sofa Bed). 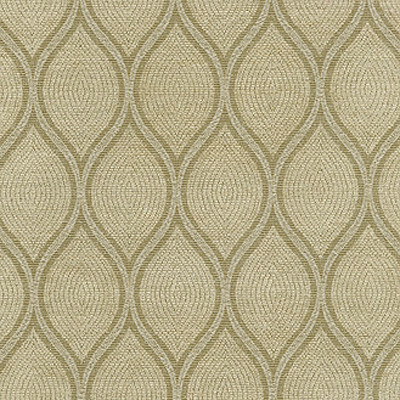 It's nice and dark, so it will hide any dirt or stains well (perfect in a house with two dogs and a baby), and it's the perfect texture to stand up to high traffic, while still being soft and warm under foot. 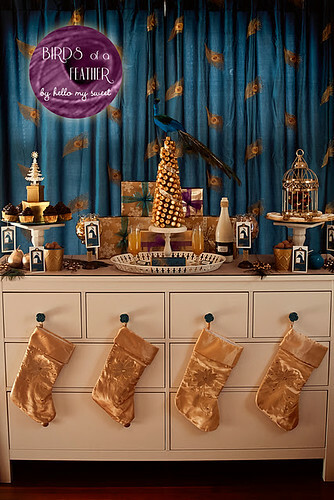 Have you been working on any tweaks in your home to prep for the rush of holiday guests? 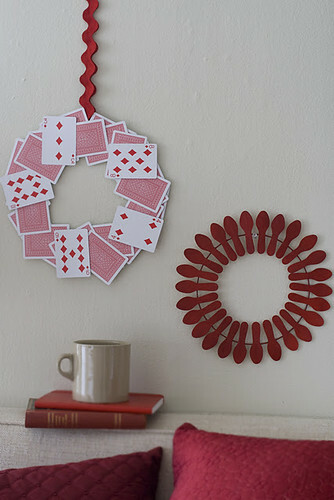 Or are you just focusing on getting your Christmas decor up? I'm back this afternoon because I just HAD to share some Christmas spirit with all of you! To most, Christmas is all about that special Christmas feeling! That warm fuzzy feeling you get while wrapping gifts, putting up your tree, listening to those special songs, watching your favourite movie... and of course sharing this all with your family and friends. Well, this Christmas - Canadian Tire wanted those warm fuzzy feelings of the Christmas season to be visible to all, and they have put up the Christmas Spirit Tree right in Union Station in Toronto. The 30-foot tree is made up of 3,000 LED lights that are powered by Christmas spirit messages from various social media channels! Cool, right? So how can you help brighten the tree, and Christmas spirit? It's super easy. You can write a blog post, tweet, or post on facebook with some positive messages of Christmas spirit! 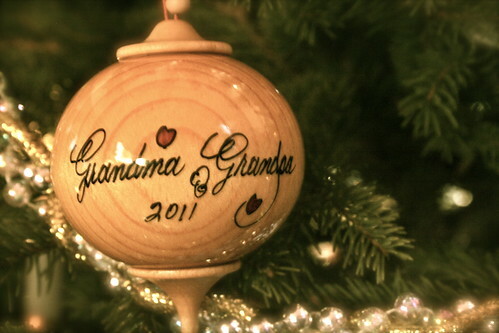 You can also head directly over to ChristmasSpiritTree.ca to write your message, or text "Christmas" to 70734. 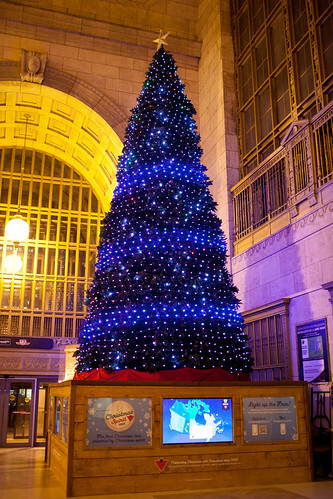 All of your positive messages will help to light up this fabulous tree, which is on display daily until December 26th from 6:00am until midnight. If you can't make it down there in person to check it out, you can watch a live feed of the tree right here. 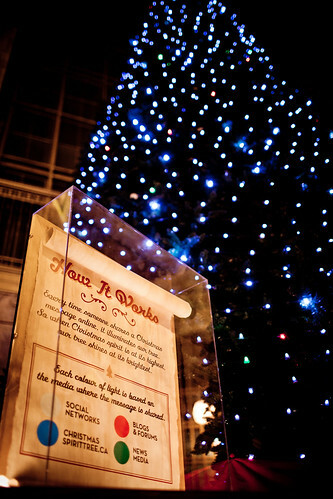 Have you been to see the Christmas spirit tree?? Will you be sending out some positive Christmas spirit messages to help light the tree? Oh, and how could I not leave this post without wishing all of you a very Merry Christmas! Aren't they absolutely gorgeous? 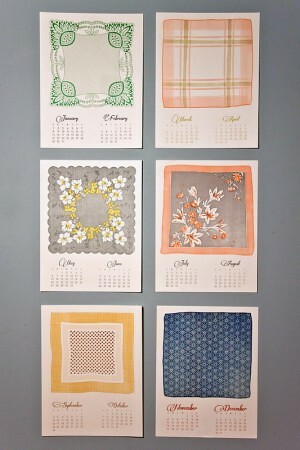 I love them and want to order sample swatches in each colour! Even though it says it is dry clean only, I am so tempted to order it in one of the blue's or the Mica to recover that garage sale chair that we bought ages ago. 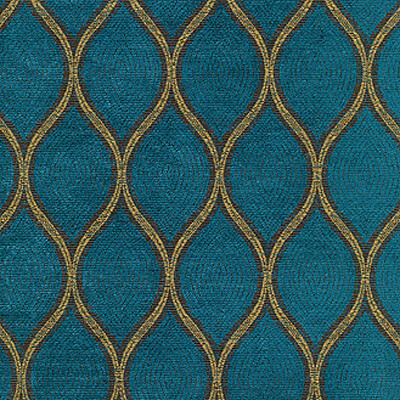 I'm so ready to recover that bad boy and have it in our living room after the holidays, and this is the first fabric I have found that has made my heart skip a beat. What would you do? 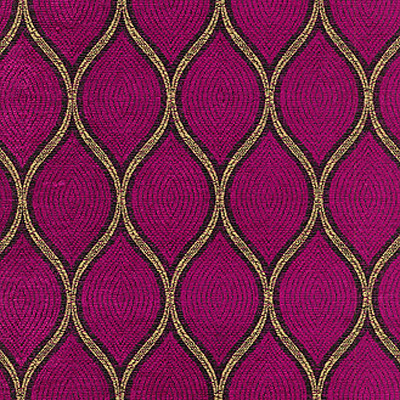 Have you stumbled across any beautiful fabrics recently. Happy Monday! We had a fabulous weekend, and hope that you all did too. Friday when B arrived home from work we headed down the street to grab dinner, and Halle was an absolute doll through the whole thing! Afterwards, we headed over to the mall to do some Christmas shopping. 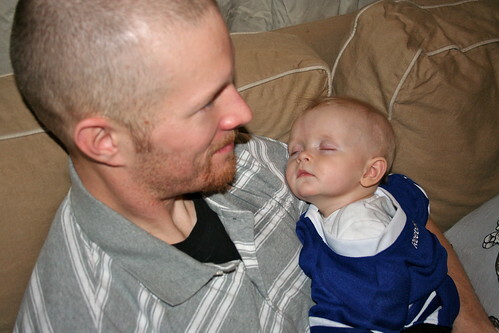 We only left with one small stocking stuffer for Halle, but again, she was a perfect angel. That would be our bathroom... a view I am not accustomed to from our kitchen doorway. 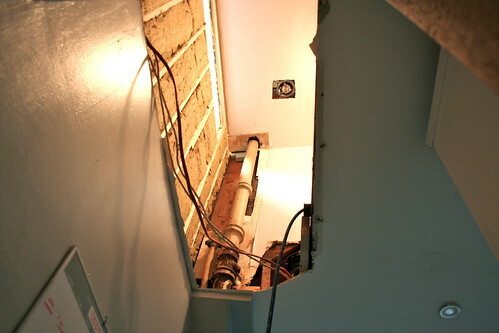 B was repairing the floor joists, and found the drywall wasn't attached very well to the damaged joists, and had started to sag - so out it all came. The fun never seems to end over here! He called it a day around 4:30 and the two of us got ready to head for a night out, while Halle spent the evening hanging out with my parents. I am just loving these holiday weekends with family... even if it leaves me with a ton of house work to accomplish come Monday morning! Which means... I better get to it! What did you cherish this past weekend? 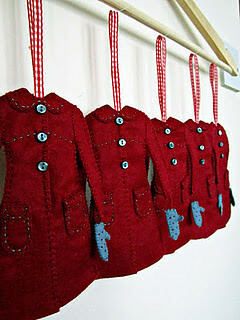 Annie, from Sew Graceful, made some pretty winter coat ornaments for her friends this Christmas. She was inspired by some from Posie Gets Cozy... and I'd say she did a fantastic job! 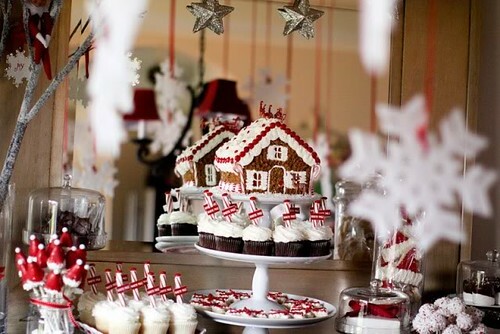 I was completely enchanted by this North Pole themed gingerbread house decorating party, from Kara's Party Ideas. 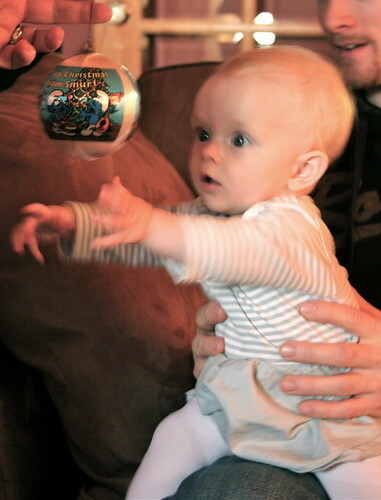 Oh the fun things we'll be able to do with Halle girl when she's older! 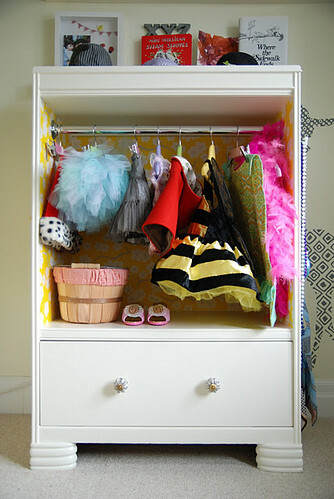 I wish I'd had a little costume closet, like the one Jen made for Chloe, when I was a little girl! 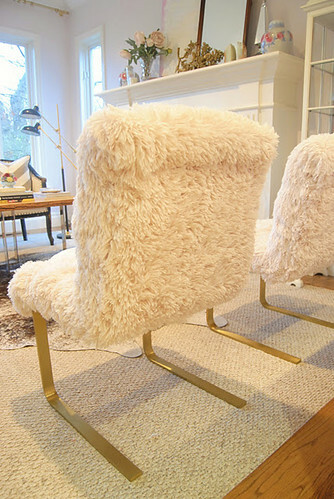 While we're talking DIY - did you get to see Christine's fabulous chairs? We've seen so much of her home recently, and I'm loving all of it! I'd like to think that if I'd ever had my own bachelorette pad, that it would've looked something like Ana Antunes living room - which I found on House of Turquoise. 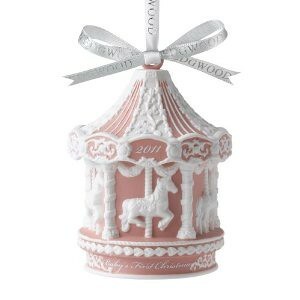 It is perfectly girly and fabulous! 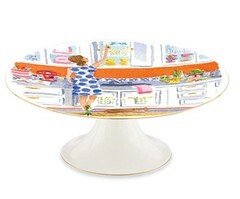 I was so giddy when I stumbled across this post on a life's design on Wednesday! I fell in love with this home ages ago when it was featured in House Beautiful - so I was thrilled to see it all decked out for the holidays. 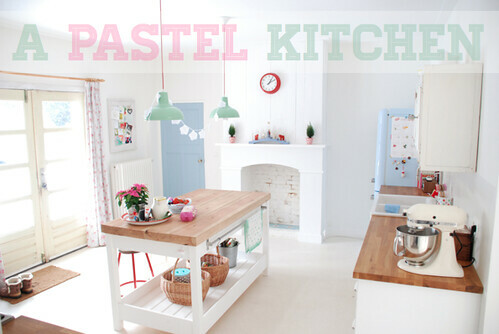 It is most definitely my dream home! Click over for all the holiday yumminess! 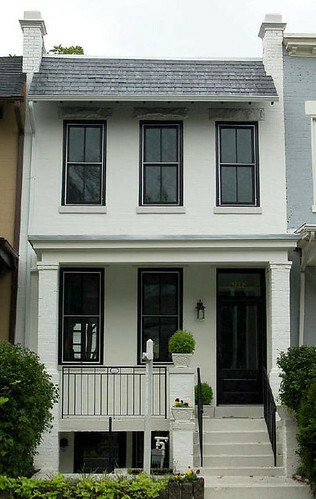 If you haven't already - be sure to check our the mind-blowing before and after's of this home on desire to inspire. What an incredible transformation! Another festive weekend lay ahead for us! It's the weekend of cutting down and decorating my parents Christmas tree, and I also plan to do more shopping and wrapping. Saturday night, B and I are also looking forward to a date night while the munchkin gets to spend some time with my parents. Plus, I've been spending my days this week getting our home Christmas AND guest ready - so keep an eye out for those posts next week! Demo Days Are Behind Us!